If Figueres had known then that Donald Trump would be elected president, she probably wouldn’t have slept at all. The two months that Trump has been in office have been a bloodbath for climate change policy. He picked a climate denier to head the Environmental Protection Agency, purged the White House website of any mention of climate change, and his first official budget proposal was full of egregious cuts to environmental programs, including slashing the EPA’s budget by 31%, which would leave the agency limp and toothless. Trump is working to roll back Obama-era vehicle fuel efficiency rules, collaborating with Congress to undo rules that monitor methane leakage from oil and gas wells, and is slated to sign an executive order dismantling Obama’s Clean Power Plan and other key aspects of the former president’s climate legacy later this week. All of this backtracking raises the question of whether Trump will “cancel” and “rip up” the Paris Agreement like he pledged to do during his campaign. Fortunately, it’s not that simple. And Figueres is confident that the Paris Agreement can withstand the likes of Trump. The Paris Agreement is best thought of as a collection of pledges from individual countries, each one spelling out how they will reduce their own emissions by certain amounts; together, these so-called “Intended Nationally Determined Contributions” (INDCs) make up the bulk of the agreement’s action plan. Any country, including the U.S., can decide to not follow through with their INDCs, but that alone wouldn’t alter the pledges from the other signatories. Stay in the Paris Agreement, but since emissions reduction targets are nonbinding, undo all of Obama’s climate policy and carry on with business as usual. Although none of these actions would cancel the Paris Agreement, they would all represent a major step backward for climate action, both domestically and globally. In this Dec. 2015 photo, French President Francois Hollande, right, French Foreign Minister and president of the COP21 Laurent Fabius, second right, United Nations climate chief Christiana Figueres, left, and United Nations Secretary General Ban Ki-moon hold their hands up in celebration after the final conference at the COP21, the United Nations conference on climate change, in Le Bourget, north of Paris. It’s poignant that Figueres brings up the economic incentives of a green energy economy, as that is precisely the line of attack that Republicans have been using against climate regulations for decades. In 1997, when Vice President Al Gore attempted to get Congress to sign onto the Kyoto Protocol, Republicans refused on the grounds that it would cause “serious economic harm to the United States.” When Obama proposed his Clean Power Plan in 2015, Senate Majority Leader Mitch McConnell lambasted the plan as “job-killing and likely illegal.” And when President Trump announced in March that his administration would re-evaluate Obama-era fuel efficiency rules, he claimed he was eliminating “industry-killing regulations”. In short, climate change regulation has long been married to “job-killing” in the eyes of most modern Republicans. But Figueres isn’t alone in asserting the opposite opinion: that investments in clean energy can actually create millions of jobs. Still, the negotiations succeeded in producing the Kyoto Protocol, a treaty that pledged to reduce emissions from industrialized countries by about 5.0% against 1990 levels. The agreement was praised by then-President Bill Clinton as a “historic agreement” that “reflects a commitment by our generation to act in the interests of future generations.” The only problem was that Congress never ratified the treaty. While the U.S. certainly hurt the Kyoto Protocol, it didn’t kill it. It was still adopted by the European Union and a few other countries, becoming the first major international treaty to curb emissions. And so it carried on, a sort of half-treaty and a testament to the difficulty of international climate negotiations. 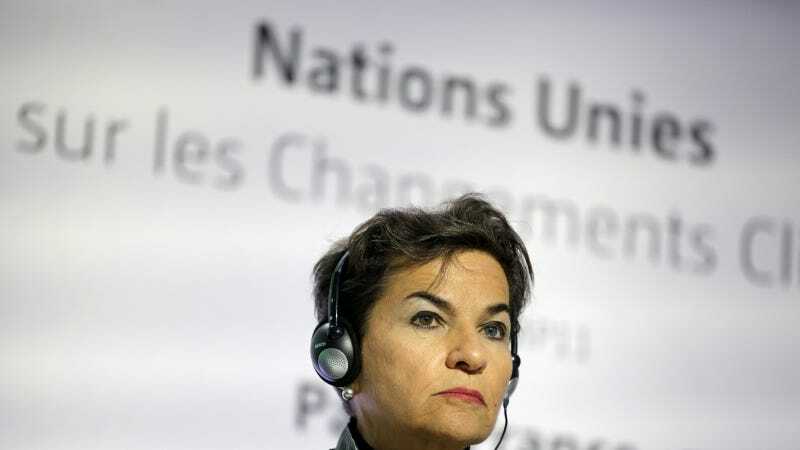 “If the United States pulls its funding from the United Nations, as a whole, or from the United Nations Framework Convention on Climate Change, or from its pledges to climate finance…that will make it politically very, very difficult for developing countries, in particular, to move forward,” said Figueres. A U.S. retraction of funding would send a very clear message to other countries, and potentially make the rest of the developed world less likely to pay their share. The domino effect would ultimately make it much harder for developing nations to finance their transition away from fossil fuels. Still, backing away from the U.N or withdrawing U.S. funding isn’t a decision that Trump will take lightly; such a move would come at a huge political price, damaging U.S. relationships with key allies and reducing the country’s credibility on foreign policy issues. This is one of the reasons why some key Trump advisors, including Secretary of State Rex Tillerson, have been advising Trump to stay in the Paris Agreement.